Personally I am a fussy eater. Only two things I eat without even thinking, those are prawn and sweet. I even don’t want to live if prawn and sugar become extinct from world. 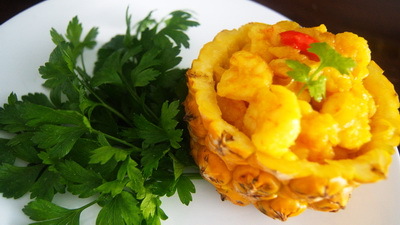 So I am doing Anarosh Chingri /Sweet and Sour Pineapple Prawn recipe which has sweet and sour flavour which very few ingredients. 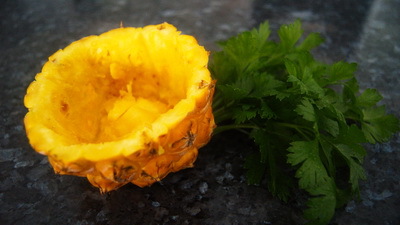 You can make this simple dish more interesting to serve inside pineapple. Hope you will enjoy this dish. 1. Heat the pan with oil. When oil is ready, add onion and bay leaf, fry it till onion become lite golden brown. 2. Add turmeric, coriander powder and onion paste and cook it till oil is separated. 3. Add prawn, green chillies and salt. Cook 2 -3 minutes and stir occasionally. 4. Add chopped pineapple and cook till prawn becomes tender. 5. Add sugar, cumin or coriander leaf. Stir it and check the salt. 6. Remove Anarosh Chingri / Pineapple Prawn from heat. 7. 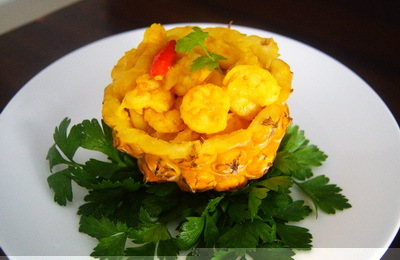 Serve Anarosh Chingri / Pineapple Prawn with rice or polau. 1. When you are chopping pineapple, chop in a bowl. Because we want juice too. 2. If pineapple is too sweet, don’t use sugar.